Steve Jobs announced at the Macworld Conference & Expo to announce new products. The rumors were true. 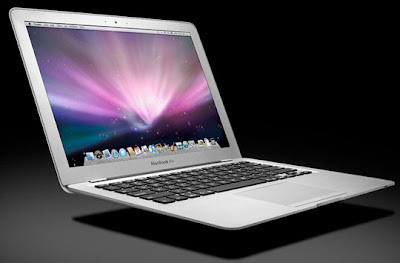 Steve Jobs unveiled Apple's latest portable, the $1,799 MacBook Air, which he called the "world's thinnest notebook." Dissing Sony's TX series, Jobs said that other subnotebook manufacturers inevitably compromise on the display, have mini-keyboards, and run too slowly due to heat issues. 19mm thick at thickest point, weighs 1kg. The MacBook Air is silver, weighs 1kg. and has a wedge-shaped profile that's 19mm thick at the fattest point and 4.1mm thick at its thinnest point. There's a full-size keyboard, a 13.3" widescreen display with LED backlighting, and a built-in iSight. The keyboard has an ambient light sensor similar to that of the MacBook Pro, and the trackpad supports multitouch gestures for panning, zooming, and rotating. On the hardware side, the MacBook Air comes standard with an 80GB 1.8" hard drive, with a 64GB solid-state drive available. It's powered by an Intel Core 2 Duo running at 1.6GHz, with an option for a 1.8GHz model. According to Jobs, the Core 2 Duo in the MacBook Air is 60 percent smaller than standard C2D CPUs. There's no optical drive or Ethernet port on the MacBook Air. The new laptop only includes built-in 802.11n, USB, DVI, and a headphone jack. Software installations can be done remotely using "Remote Disk," which allows the MacBook Air to access the optical drive of a networked Mac or PC. Jobs also touted the environmentally-friendly nature of the MacBook Air. It has a full aluminum case, which he said is "highly desired by recyclers," a bromide- and PVC-free motherboard, and the retail packaging takes less than 50 percent of the volume of the previous packaging.